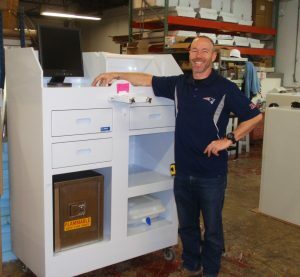 For over 25 years, Plastic Concepts, Inc. has specialized in fabricating plastic furniture and products for laboratories across many industries. You’ll find us in Biotech, Pharmaceutical, Cleanroom, and Animal Research Labs and in Semiconductor, Plating, Solar, Fiber Optic facilities across the U.S.
Our product lines include fume hoods, chemical tanks, storage cabinets (desiccator, chemical, garment), clean room equipment ( pass-thru ports, casework, glove boxes) wet process stations, animal research equipment and more. We use materials such as Polypropylene, PVC, Acrylic, Teflon and etc, which offer superior chemical and organic matter resistance over metal and wood products and can be customized to meet your specific needs. Our in-house technical group provides design, engineering, and CAD support to our customers, as well as a design review stage which allows for changes prior to fabrication. So, we can easily offer improvements to operator interface and maintenance considerations for equipment. Plastic Concepts, Inc. also offers field service for installation, modification, and repair of our products. While our service and quality are unsurpassed, our pricing remains competitive. Please feel free to contact us at (978) 663-7996, fax: (978) 663-7880, info@plastic-concepts.com, or through our contact form for any questions you may have.